If you're at high risk for coronary disease or a heart attack, you may find that eating fish can improve your heart health. Unlike red meat that is chock full of cholesterol and saturated fat, fish typically contains a high amount of omega-3 fatty acids, which can help lower your bad cholesterol levels. In fact, eating a fatty fish variety like salmon or mackerel twice a week can significantly decrease your risk of abnormal heartbeats that can lead to sudden death. 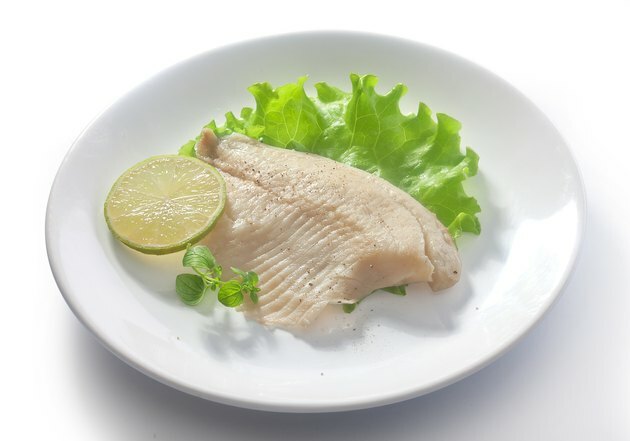 Although you may be tempted to fry your fish, steaming a well-seasoned fillet in the oven is a low-fat and healthy alternative. Preheat your oven to 400 degrees F for 10 to 15 minutes. Clean your fish under luke warm water to remove any debris. Scrape any lingering scales off with a knife and rinse out the interior of the fish. If you're using fillets instead of a whole fish, be especially careful, as the flesh can easily break if you handle it too vigorously. Spice your fish using your desired ingredients, such as lemon pepper, soy sauce, paprika, garlic powder or an Italian blend of seasonings. If you're using a whole fish, you will need to season the interior rather than the outside. If you're stuffing the fish with any fresh ingredients like herbs or vegetables, place them inside the fish. Line your baking dish with aluminum foil. Use enough so you have flaps that can fold over the fish. Place the grill rack in the baking dish. Pour or squeeze lemon juice on the fish. You'll need approximately 3 tbsp. of lemon juice for every 4 oz. of fish. You can use any liquid you prefer, but your measurements may be more or less depending on the strength of whatever you choose. Add 2 tbsp. of water to the bottom of the baking dish. Enclose the foil around the fish and leave a 2-inch lateral opening at one end to allow steam to escape. Put the baking dish inside the oven and allow the fish to steam for approximately 15 to 40 minutes, depending on the cut and type of fish you use. Generally, a whole fish will take between 30 to 40 minutes, while 4- to 6-oz. filets will only take 15 to 20 minutes. Monitor the steaming closely, as you don't want the fish to overcook and become tough. Halfway through the allotted time, look at the fish to ensure that it is cooking properly. The flesh will appear plump and lighter in color when it's done. If you’re unfamiliar with cooking fish, use a food thermometer; the internal temperature should be 145 degrees F. For the most health benefits, eat fatty fish varieties like salmon, tuna, trout, herring and mackerel.